Includes Bach’s Sonatas Nos. 1, 2 & 3 and Partitas Nos. 1, 2 & 3 ; Mozart’s Violin Sonatas in C and E Minor ; Beethoven’s Violin Sonatas Nos. 5 “Spring” and 9 “Kreutzer”; Brahms’ Violin Concerto ; Bruch’s Violin Concerto No. 1 ; Chausson’s Poeme ; Dvorak’s Violin Concerto in A Minor ; Glazunov’s Violin Concerto ; Prokofiev’s Violin Concerto No. 1 ; Tchaikovsky’s Violin Concerto , plus Mussorgsky, Rachmaninoff, Rimsky-Korsakov, Massenet and more! 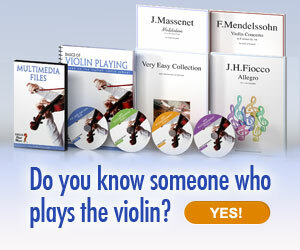 Be the first to comment on "Icon: Nathan Milstein – Aristocrat of the Violin"